Webkinz Plush Stuffed Animal Spotted Dinosaur GARBAGE, Avi Depot=Much More Value For Your Money! Series: Webkinz World - online games, activities and fun! Details (Description): Webkinz toys are a collection of very special plush pets. Every Webkinz pet wears a tag with a secret code that can only be read after purchase. This code is the password into Webkinz World, an online world for the young at heart. After they log in, kids can name and adopt their new pet, learn all about it, play and have fun. Furnish a room, chat with other members, play trivia challenges and visit the arcade. Shop for clothes, food, toys and furniture at the W Shop. Welcome to our Webkinz & Lil'kinz World! Webkins is an exciting online virtual experience where your plush pet comes to life. 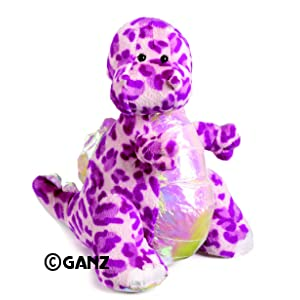 Each plush pet comes with a special code that lets you adopt your pet in Webkinz World.